Campus is the nesting place for thousands of Ducks. It’s the center of Duck life, where cultures mix and mingle, and lifelong friendships are forged. And living on campus can actually enhance your learning experience. Fact: students who live on campus achieve higher GPAs than those who don’t. With many accommodation options available, you can count on finding something that will suit your needs. Four meal plans. Three on campus and one off campus. You’ll find there’s never a shortage of great gastronomical options. Looking for a buffet? A quick bite? A place to study with a double half-caf soy latte? No problem. 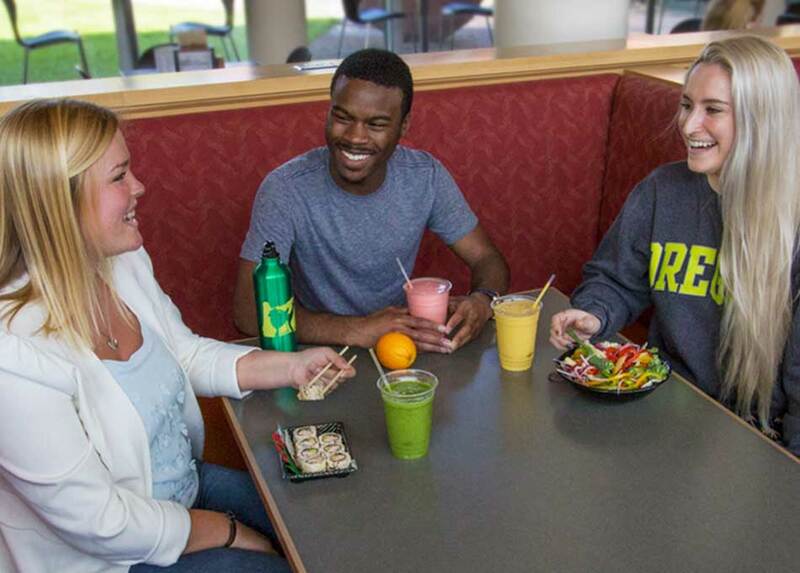 There are nine unique, sustainable dining locations on campus. And each uses locally farmed, seasonal ingredients. Combined with your off-campus choices, you’ve got a never-ending lineup of tasty grub and healthy epicurean delights. We deliver a world-class education and exceptional experience to our students from around the world. Tuition and state support are the two main sources of revenue that pay for the bulk of our operating costs, from faculty and staff salaries to classrooms and libraries, and academic advising, information technology, facilities, fundraising, admissions, human resources, and over $40 million in financial aid and scholarships that help ensure we remain accessible to every qualified Oregonian who wants to attend. Resources & Services. For Current & Future Ducks. Navigating a college career can be difficult. So we provide an array of academic and social resources and services for future students, current students, and their families. Financial aid questions? Let’s talk. Ethnic and cultural resources? Looking for a mentor program? We’ll point the way. All you have to do is ask. Find Your Way with Others. College is about a lot of things, but most crucially, it’s about discovering who you are and what you’re interested in. Which is why we host more than 160 student organizations on campus. Club sports, honor societies, student unions, sorority and fraternity groups, you name it. There’s something for everyone here. And if you don’t find what you want, we’ll show you how to start your own group. So you can meet like minds and learn about life alongside others. Out here, the great outdoors aren’t someplace you go. They’re everywhere you are. Our campus, it’s an arboretum. Literally, a tree museum. To get to our stadiums, you may walk through woods or cross a river. Hikes, rafting trips, and mountain bike excursions aren’t things we only do on weekends. They’re things we do on Tuesdays or between classes. Need gear? Rent it. We make it easy for you to get out there. And if you want, way, way out there. The Student Recreation Center, Gerlinger, Gerlinger Annex, the Student Tennis Center, Mac Court, 18th Street tennis courts and track, and many other natural and turf fields. All are outstanding facilities, and all are available to students of every skill level. So you can play to your heart’s content. Our intramural sports span every skill level so anyone can get a team up and running and have a good time. Playing competition mushball, inner tube water polo, and table tennis, for example. 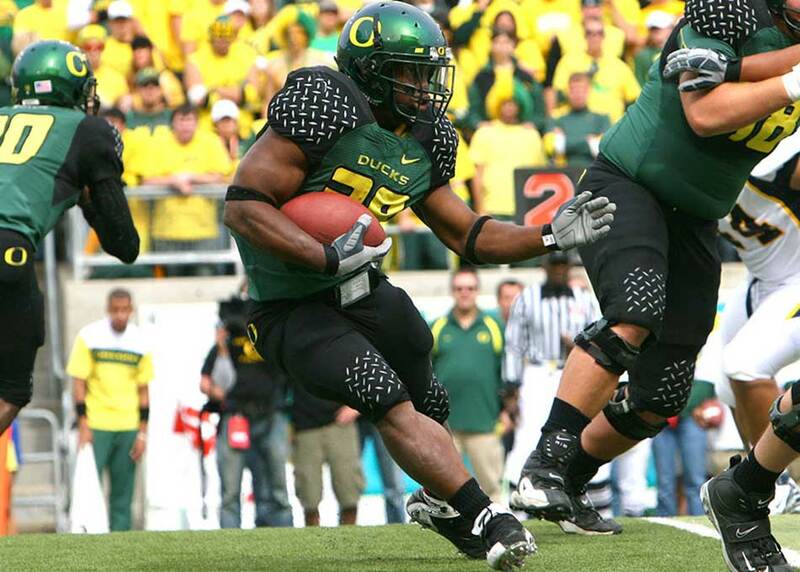 Athletics are an integral part of the UO experience. We compete in 17 NCAA sports, and have 24 national championships as a result. Competition is in our blood. So whether it’s intramurals, a pickup game at the rec center, or a nationally televised game, Ducks are always up for the challenge. And here, supporting and cheering on our fellow Ducks is more than a pastime. It’s a full-time job. Go Ducks! Campus is large, lush, and green. Which is nice. But while it’s beautiful and a joy to walk around, sometimes it’s easier to just take our free shuttle. We want a campus environment accessible to all. A place where we all take care of each other. Our shuttle program fits the bill. It helps students and faculty members get across campus, around town, and home safely. And on time.